You won't see the usual suspects that I'm so tired of seeing on annual roundups featured in glossy magazines and newspapers. True, I haven't tried all of those exclusive places and my wallet has inevitably dictated where I've gone in 2008. But I also want to stress that there is culinary life beyond the fancy hotel restaurants and $200+ sushi palaces in LA. I wait for the day when good food throughout LA will be recognized as such, without the monikers "Best Ethnic Food" or "Best Cheap Eats." I believe these are the best that I've tried within my budget. Enjoy. It looks intimidating at first but inside this mass resides the juiciest, most tender slow-cooked pork you'll ever find. The meat has just the right amount of fat and seasonings for a perfect complement to the string beans. Thanks to AC & family! The only downside to this joint is the wait but a new branch behind the old one has signficantly reduced the wait. Either go early or late and you'll be fine. I recommend the pork soup dumplings, which are piping hot (careful not to burn yourself -- follow the instructions on the chopsticks cover -- just trust me) and have an incredibly flavorful filling of ground pork and other goodies. If you're so inclined, get the crab dumpling but it isn't the same. I also like the low prices. It's something between a taco and a quesadilla, so what's not to like? The carne asada was good and I'm looking forward to trying the al pastor and seafood options. If you like ttukbossam, the delicious pairing of rice cake paper with thin slices of meat and other toppings, I daresay Hanyang may be a more interesting choice than Shik Do Rak, the old standby. The reason: the garlicky and spicy red sauce that is smothered on the green onion mix. It simply adds a touch that you won't find at Shik Do Rak. You can't go wrong with Almir, the master of Brazilian barbecue, complete with rotating skewer grills and caipirinhas cocktails to boot. His to-die-for catering repertoire includes top quality filet mignon, tri-tip, rib-eye, bacon-wrapped chicken, lamb chops, ribs, etc. The list goes on. It will be the best party you'll ever host. For a quick meal that's nutritious, cheap and fast, I head to Aloha Cafe in Little Tokyo's Honda Plaza (of Sushi Gen fame). It's a quaint little place that serves up Hawaiian standards like Kalua pork and Loco Moco -- and most plates come with a scoop of rice and a nicely toasted piece of Hawaiian bread. My favorite is the special braised rib that is fall-off-the-bone tender. You may want to ask for the gravy on the side. My partner in crime YT and I kicked off our cooking extravaganza series by venturing into unfamiliar territory -- Persian food, courtesy of cookbook, New Food of Life by Najmieh Batmanglij. My personal favorite was a walnut and pomegranate chicken dish that I made again and again with basmati rice thereafter at large gatherings to rave reviews. It's fairly easy and different from what I'm used to cooking so I'm glad that I broadened my cooking horizons. I wish there were more Chileans living in LA so we'd have a Julia's equivalent. 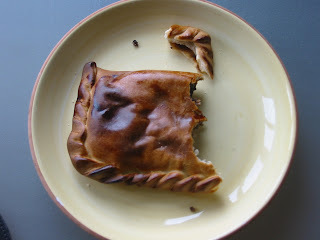 Empanada's Place and other Argentine joints don't cut it for me. I miss Julia's excellent spicy, baked ground beef version with a black olive inside. The lines forming outside of Julia's after midnight despite bone-chilling weather speak for themselves. Sigh. The meals I remember most fondly (besides my Mom's cooking, of course) are the super meaty and succulent grilled kalchi fish from Jeju Island that I had in Seoul and the kyejang, or raw crab marinated in garlic, soy sauce and other seasonings. I guess I miss the fresh and chunky seafood you get in Korea that you can't get here, for some reason. Who knew that you could use garlic leaf to add flavor to a pork dish? Truth be told, I didn't even know there existed such a thing. Being a garlic lover, I couldn't have been happier to discover at Sosonjae in Seoul that they first pickled this garlic leaf in a soy sauce-based liquid and used it to wrap steamed slices of super-tender pork. Genius! I look forward to another fruitful year of eating, cooking and other stomach-happy revelations!